Hi guys! How’s your winter going? Seems like most of North America is experiencing a weird kind of winter — warm some weeks, freezing others, who knows what’s going on! Since we just started the year, we won’t go full on into sinful indulgence, but we will turn up the heat with a tasty recipe. 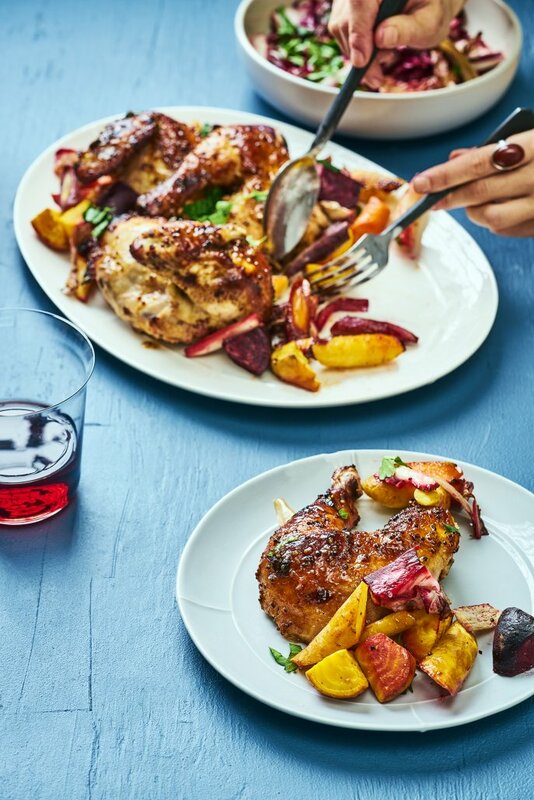 This hot mustard glazed chicken is the key to your winter ailments, perfect to make at the beginning of the week and eat for a few days or to have it during a tv show binge marathon. 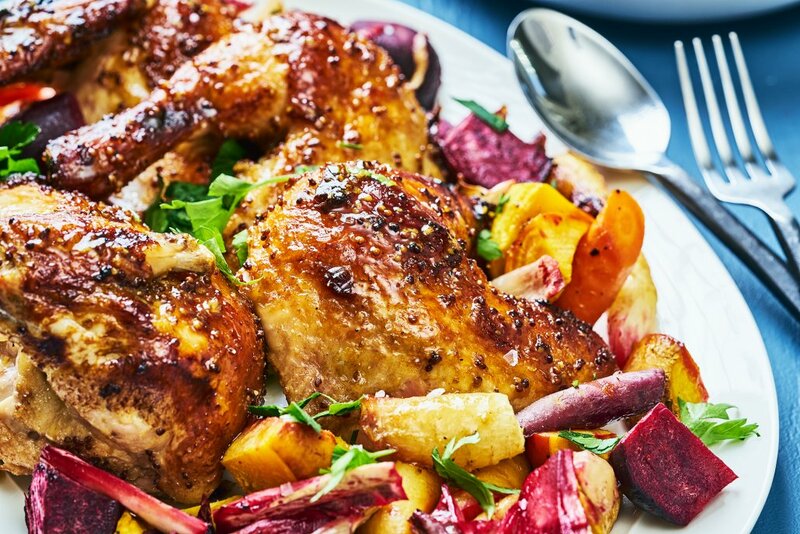 This recipe has a really nice combo of spice and citrus; the spice comes from a super tasty mustard glaze that makes the chicken super crispy and bbq-like. The citrus marinade for the veggies is fresh, tasty, and super easy to make. You can combine almost any citrus (maybe except for grapefruit since you don’t want it to bitter). Meyer lemons are really nice and fragrant! If you find some, add them in there too. 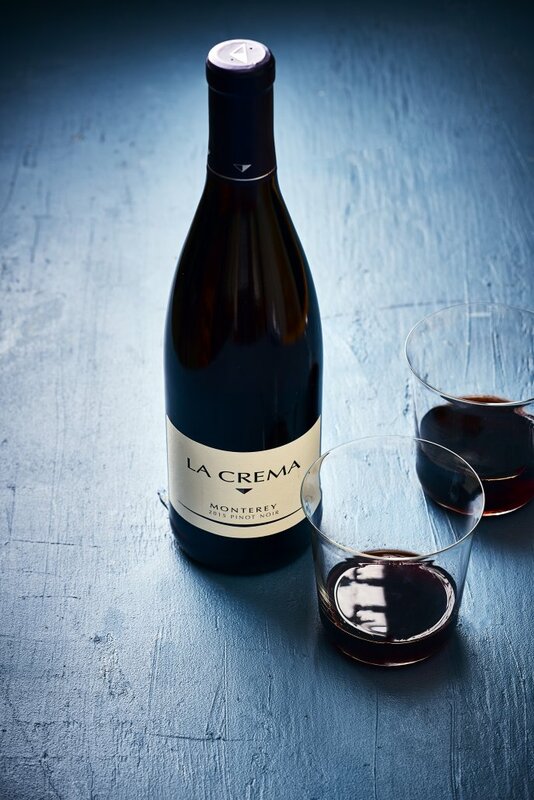 Working with these flavors I decided to pair this hot mustard glazed chicken with La Crema’s Monterey Pinot Noir which has some really nice subtle citrus/fruity notes (blood orange and plum), and a delicate earthy finish — I think that really brings out the taste in the chicken and the beets! You can make the chicken ahead of time (the night before) and leave it in the roasting pan with the glaze in the fridge, then glaze again the next day and cook, that way the flavors will really get into the meat. But, if you’re in a rush, making it on the spot works fine. Begin by making the marinate for the chicken. Combine all the ingredients and rub on the chicken skin, allowing the flavours to penetrate the meat as much as possible. Let the meat rest in the fridge for at least 4 hours to absorb flavours. Meanwhile peel the carrots and beet. Cut the carrots in half lengthwise and the beets into 1/4s. Combine the veggie marinate and cover the chopped carrots and beets. Place them in the fridge along with the chicken and let them soak the marinade for about 30 min. Take out the chicken and place in a roasting pan, glaze again (use any glaze than ran out to the bottom of the pan), season with salt and pepper and bake for 20 min at 400F, then decrease the temperature and bake at 350F for another 30-40 minutes until fully cooked. To test, run a knife along the thigh, liquid should come out clear, if it’s a little bloody cook for a few extra minutes. Remove cooked chicken from the oven and place by the stove, cover with aluminum foil and let it rest before carving. Increase the oven temp to 400F. 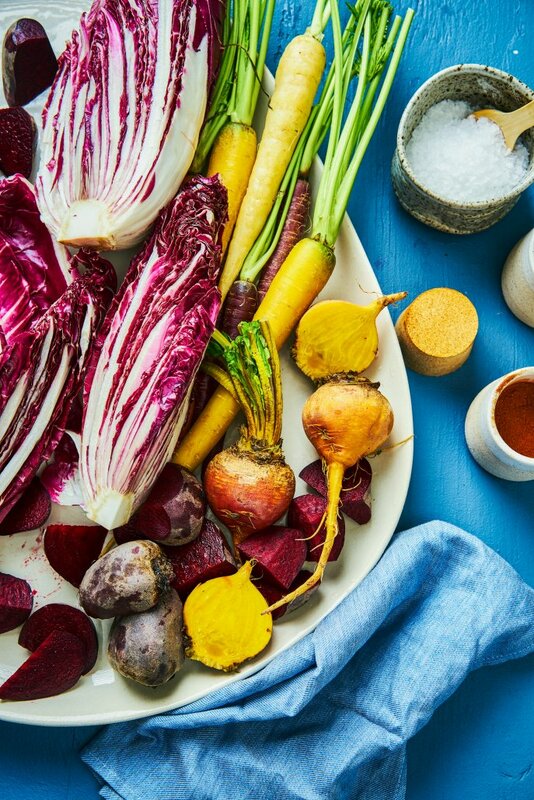 Place the marinated veggies on a tray with parchment paper, season with salt and pepper and roast in the oven for 20-25 minutes until beets look slightly shrivelled, you want them still crunchy and not fully cooked. Take out the veggies and place in a bowl. Chop the raddichio and add it to the warm veggies. Add a little splash of olive oil and toss. 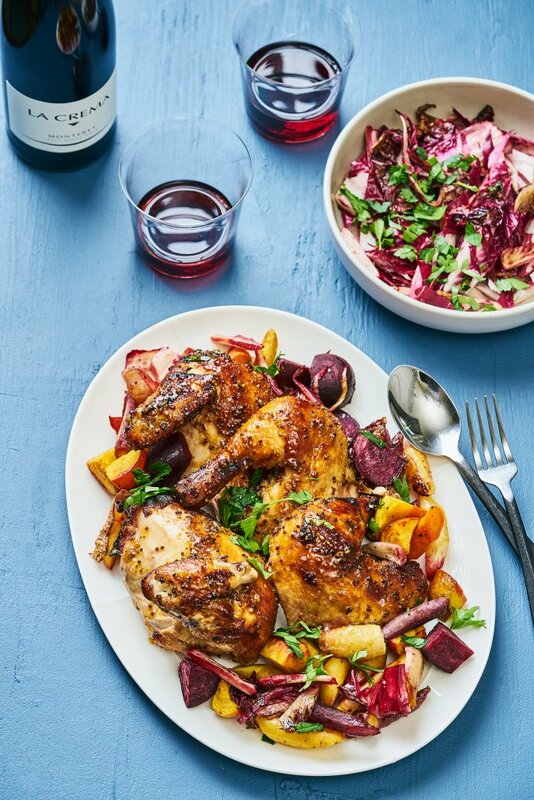 Carve the chicken, place veggies next to it and dig in!